One of the great advantages of working with RAW files is the ability to control the white balance in post production. For example, if you have mistakenly forgot to move your white balance settings from shade to tungsten when you switched location, you can spend two minutes in Lightroom, Photoshop or Adobe Bridge and make the red blue again. But, but… What if you could make sure that your white balance setting is perfect every time? You can then save on precious post processing time and deliver your images straight from the camera. Point your camera to a tungsten bulb and the sensor will see a reddish white; Point your camera to a fluorescent light and your sensor will see a greenish white. Now what if you set your white balance according to the white blanket exposure? You are sure to get the correct white balance reading, since you are reading it directly from the light source. Now wouldn’t be nicer if you could do it for less then a dollar? Less then a cent? Reader Jason Wallace invented the CoffeeFilterDisk. 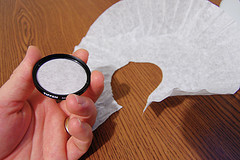 It is a small coffee filter circular cut that you can place on any old UV filter and achieve a similar effect. You can read the full post on DIYP Flickr threads. IT also have some great samples of using the cheapo white balancer. The nice thing about this gizmo is that it will work even without the UV filter. Just mount a piece of tissue on the lens. Hold it tight and make the shot. UPDATE: it turns out that the default permissions of the discussion threads is private. this why the link did not work. I made the changes to allow everyone to view the thread. Of course DIYP group members were never blocked.